identification and determination of generic (group) belonging of individually determined objects on the ground of materially fixed traces – reflection of their trace-forming surfaces; diagnostics (determination of peculiarities, conditions) of objects; situational tasks (determination of the trace- formation mechanism). Trace examination can also determine facts that belong to spatial, functional, structural, dynamic and some other characteristics of the trace-forming process and also peculiarities of trace-forming objects. Trace examination may deal with issues with the traces interaction with other objects, on objects at the scene, the suitability of these traces for identification or presence in these traces of features that guide the search for these objects. *5.2. To solve identification task an expert must be provided with: objects with traces, if they can not be removed then copies of traces (casts, photos); objects with the help of which by assumption of a body (a person), that commissioned an expertise (engaged an expert) these traces could be left; data about time of detection of traces, conditions in which objects with traces were before the commission for the examination. If a copy of a trace is sent to an expert on a dactyl-tape or other copy of the trace, it is necessary to prove a scheme of its placement on the surface of an object. 5.3. Researched objects are sent in a package that insures their preservation. Material evidences and comparative samples are packed separately. Surface of the object on what there are traces, that can be damaged easily, for example, traces of hands of different types of overlaying, etc. don`t have to contact with material in the package. Individual marks are placed on the comparative samples and certificated by a signature of the body (person) that has commissioned an examination. Recommendations that deal with the preparation of comparative samples according to subtypes of trace examination, presented in the appropriate parts of this section. 5.4. The main subtypes of trace examination are: examination of human hands prints; examination of human footprints, their shoes, socks, stockings; examination of traces of gloves, human clothes, traces of damage, traces of overlaying on objects; examination of footprints (traces of paws) of an animal;examination of tools, aggregates, instruments, cold steel, traces caused by them, identification of the whole by its parts, examination of traces of tools and instruments;examination of tracks of vehicles, examination of locking arrangements and check devices; examination of sings of the separation of the whole on parts; examination of relief signs on metal, plastic and other materials; examination of knots and loops. It is possible to conduct trace examination using trace-forming objects, in particular teeth (other parts of human or animal body), different types of mass production items. Consultation about possibilities of examination and preparation of materials for their conduction can be taken from an expert (a specialist). The main objective of dactyloscopic examination is to identify a person using handprints from the scene. If the version about a person who is the owner of a handprint hasn`t been already raised, and also if an investigator consider it necessarily to determine if there are invisible or slightly visible handprints on objects at the scene, an expert may deal with the question of availability of such handprints and their suitability for identification of a person. Examination of human handprints solves also a range of unidentified tasks, connected with the determination of trace-forming mechanism, peculiarities of hand structure by which the handprint was left, some other characteristics of a trace-forming object. • Are there any handprints on the object? • Are these handprints available for identification of a person? • Did a particular (one) person leave handprints? • Were handprints of one person seized from different places? • Are there any handprints on this object and if they are, are they available for identification? • By what hand and with what fingers were handprints left? • What peculiarities do hands of a person who has left handprints have (absence of fingers, scars, etc.)? • What parts of a palm were used to leave a handprint? • As a result of what action was the handprint left (holding, touching)? • Were handprints on the particular surface before exemption? • Are there any signs of transferring of seized handprints from one surface to another? 6.3. The objects of research with the purpose of identification of a person based on pappillate lines are fingerprints and (or) palm prints. Material evidences, on which handprints have been found or their presence is assumed, are to be sent to an expert as quickly as possible. Examination also may be conducted by researching of a copy of handprint on the print film, relief mould of handprints or large-scale photo of it. 6.4. As comparative sample experimental traces of nail-bones or traces of palms, that are to be checked, are provided. The list of people, who are checked, are also to be included persons who haven`t been involved in the commission of a crime as they could leave traces at the scene, for example, residents of an apartment, where the theft has been committed. Determination of the fact that the trace was left by a particular person would exclude searching of new suspects and commission of unnecessary examinations. If in the course of the investigative research it hasn`t been determined by what part of a hand the trace has been left, experimental traces of all 3 nail-bones of hands and traces of palms are sent to an expert. When there is information, which indicates that the trace has been left by the uppermost part of a nail phalanx except traces of nail phalanxes, then traces of these parts are selected additionally. 6.5. If it is known that the traces of hands after dactyloscopic examination will be sent on forensic examination (for the determination of blood type, etc.) 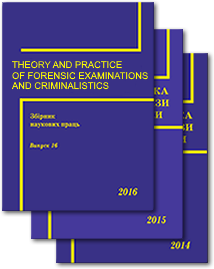 it must be noted in the document about commission of dactyloscopic examination (engaging of an expert) that will help to avoid using the methods that exclude further forensic research of the object. The main tasks of this type of trace examination are trace identification of a person: using bare foot, socks, stockings, shoes and solving of diagnostic tasks of determination moving characteristics of a person, size of shoes, height of a person, etc. • Are there any footprints of a bare foot (socks, stockings, shoes) of a person on this surface (this item) and are these footprints suitable for identification of a person (socks, stockings, shoes)? • Has a particular person left the footprints and are these footprints by socks, stockings, shoes seized from a particular person? • Did the left, determined in different places footprints belong to one person (footprints of the same socks, stockings, shoes)? • By what kind of shoes were these footprints left (socks, stockings, shoes)? • What is the approximate height of a person who has left the footprints? • What moving characteristics of a person were reflected in the "path of footprints"? • What is the mechanism of formation of footprints? When the object of examination is a mould of a relief footprint or footprint of bare foot then 2-3 experimental moulds (footprints) of the bare feet are created for the comparative research. When the object of examination is a mould then (footprint) of shoes, both this object and shoes are sent to an expert. In this case the comparative samples are created by the expert. When the object of examination is a mould (a footprint) of socks (stockings) that have been worn on a foot then in addition to the specified object, 2-3 experimental sample of moulds (footprints) of socks (stockings) that have been worn on a foot of a person, who is checked, and the socks and stockings are provided. Shoes are sent to the research in the condition they have been found. If shoes have been worn and repaired after the moment of seizure then an expert is to be informed about it. • Were these footprints left by feet (paws), teeth of this person? • Were traces of horseshoes left by the traces of these horseshoes? • Did the found in different places footprints (paws), teeth belong to the same animal? If footprints are relief experimental, then moulds of footprints (traces of paws), teeth of an animal, which are identified, are provided as comparative materials or footprints (paws) if they are surface. Photographs and/or moulds of feet (paws), teeth that have been detected at the scene are sent for the examination. If traces have been left by paws of a heeled horse then after the production of the comparative moulds of a horseshoe, it is necessary to take off the horseshoe and commission it for the examination. • determination of the mechanism (method) of breaking (other action), direction in which a breaking is conducted (from the inside or outside), type (mode) that left the trace, method of its production, etc. • Was the breaking or other action (a tree was cut, a branch was sawn, wire was torn, etc.) conducted by this instrument|( tool )? • Did the same tool leave sings of breaking, taken from different scenes? • Were the breaking conducted by one or several tools? • By what type of tool was the crime conducted? • From what side (inside or outside) was the breaking of an obstacle (a wall, window, grating, etc.) conducted? • How was the item separated (by cutting, chopping, sawing, drilling, etc.)? • Was the item produced by factory equipment? • Was this item (s) of mass production produced on a particular aggregate (die mold, press tool)? • By what type of tool (instruments) was processing of an item conducted? • Were the bottles cocked up using factory or self-made method? • Using what method were the bottle (other containers) broached or corked up? • In what way were the labels (control marks) stuck (factory or self-made method)? • Were labels restuck (control marks)? Usually an item (items) with traces are provided to an expert . As an exception, moulds from relief objects may be provided. If the object is cumbersome (for example press), its trace forming details are provided. It is reasonable to seize parts of an object with the participation of an expert-specialist. When it is necessary to indicate the direction of a damaged window glass, then an expert is provided with a frame with fragments of glass and also with all fragments from the scene. When the task of examination is identification of an aggregate ( a stamp, a mould and other) on what a unit of mass production has been created, then it is preferably to provide both the unit and possibility to research it to an expert. The body (a person) that has commissioned an examination (engaged an expert) must research, whether the identified aggregate has been repaired or debugged and if it has been, an expert should be informed about issues of repair (debugging), when it has been conducting and what details have been changed. The objects of examination are locks and other locking arrangements, stamps, check devices (means). The main tasks of examination are determination of the fact and method of unlocking (breaking) of the device, type of items that have been used for it, identification of these items, for stamps, except this – identification of stamp clams, fact of resticking of paper control devices. • Is the mechanism of a lock in working condition? If it isn`t, what is the problem? • Was a lock unlocked with an unknown object (a picklock, matched or counterfeit keys)? • In what way was the lock unlocked (broken)? • Were the locks unlocked (broken) using one method? • What was the condition (locked, broken) of a lock at the moment of its demanding? • Is it possible to unlock this check lock without damaging a check card? • Is it possible to unlock this lock using tool (item) that has been siezed from a person (name, surname, patronymic name)? • By what type of tool was a lock broken? • Did a seized from a person (name, surname, patronymic name) tool break the lock? • Was the lock opened bу this key (a picklock)? • Are there any sings on the original key typical for producing its copy or mould? • Was the stamp pressed by these sealing clamps? • Were stamps pressed by same sealing clamps? • Was this stamp opened and pressed the second time after it was pressed by a sealing clams? • In what way and by what tool was the stamp opened and pressed the second time? • Is it possible to remove the material that has been used during sealing of this stamp (wire, string, cord) without damaging of its integrity? • By what type of tool was the stamp opened? • What is the meaning of numeric and letter marks on contact surfaces? • Was the stamp opened by the provided tool? • Was this stamp sealed according to rules? • In what way was this check device unlocked (removed) and placed back? If the object of research is locks, in addition to them, picklocks and other items that could be used for unlocking or breaking and all keys of locks are sent to an expert. Locks are provided for research in such condition in which they have been found at the scene and seized. It is forbidden to stick any items in a keyhole (including staff keys) and to conduct other experiments with locks before the expert examination. Seizure of locks from safes and other storages should be conducted by an expert. To solve the problem of opening of a stamp an expert is provided with a stamp, sealing clams that have been supposed using for sealing or experimental stamps pressed with these sealing clams. To conduct an expert experiments, an expert must to be provided with 10-15 stamps that haven`t been pressed similar to those, that are being researched and samples (wire, string, cord) of materials that have been used during the sealing. Examination determines whether parts of an item (found fragments, pieces, chips, etc.) have the same line (surface) of separation, that is, whether they have formed the whole. • Using what methods were the part of an item separated? • What is the mechanism of separation from an item of its part? • Did constructive parts form the whole? • To what type does an item, that has been seized, belong? All found parts that may have been formed the whole are provided for examination. In the most cases the objects of examination are knots and loops that have been formed (made) on ropes, belts, etc. • To what type does this knot belong, does it show characteristics that point job of a performer? • Do several knots belong to the same type? • Is the knot simple (professional|)? • What professional skills does a performer of a knot (a loop) have? • Is a person, who has formed the knot, a right-hander (left-hander)? • Is the way of performing of knots (loops) the same? Before sending an object for examination, it is reasonable to take a photo of a knot on all sides in accordance with the rules of large-scale shooting in order to eliminate difficulties in cases when during examination, experiments will be conducted (unbinding or biding). For investigator it is forbidden to unbind a knot. When a loop is removing from a corpse, the rope is cut, in order not to damage the loop. Ends of the rope are tied with string. Objects of this type of examination can be presented by restored, sawn (clogged), hardly visible numbers and other relief images on different types of products. Expertise determines the fact and way of changing of images. • Was the number on this sample of weapon, aggregates of transport vehicle changed? • What was the original number on the researched item? • In what way was the number (sing) on this object changed? • Were there any marking sings on this object? • Were marking sings on this object changed? • Was marking of an object performed using specific means? Objects that can be researched can not be cleaned of dirt, paint, rust. Conduction of this subtype of trace examination helps to solve identification, diagnostic and situational tasks. 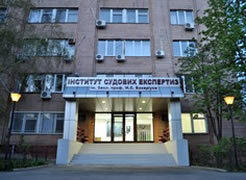 During research of the nature of damage and the mechanism of its formation, issues connected with identification (matching) of a tool according to damages on clothes are solved, etc. Related to the identification of belonging of a part of researched clothes to the whole issues belong to a separate group. • Are there any deteriorations on the given for the research clothes? • What is the nature of formation the damage on clothes? • Is damage on clothes a breach, cut or chop? • By what type of tool (object) were damages caused? • Are there any traces of friction, pressure, drawing on the given for research clothes? 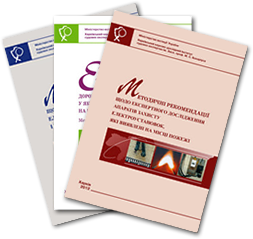 • Was damage on clothes caused by the provided for the research objects? • Do parts of the provided for the research clothes belong to one unit? of physical damage to a person, is the competence of forensic medical examination. If clothes are subject to forensic-chemical, forensic- biological, forensic-medical and other examination, then it is indicated and if it is necessary provide the results of examinations to an expert. Provided for the research clothes are to be dry. It is necessary to indicate whether provided for the research clothes have been washed, repaired, brushed, etc. Trace examination with experts of other specialties can examine issues connected with the research of layers on clothes (shoes)- soil, spots of green, paint, combustive and lubricating materials, etc. • What is the mechanism of formation of layers of soil (spots of green, paint, combustive and lubricating materials, etc.)? • What is the order of formation of layers on clothes? The main tasks of trace examination of tracks of vehicles are identification (matching) of a particular item of a vehicle according to parts and tracks, that have been left on its parts; diagnostics (determination of characteristics and condition of objects) and situational tasks (determination of mechanism of track forming, mechanism of interaction of a vehicle with other objects). Tracks of vehicles contain the large amount of information that can be used for determination of type (kind), brand of a vehicle, direction of its movement, etc. • By what type (kind, model) and by what parts of a vehicle were tracks left? • Were tracks left by this vehicle (its parts)? • By what type of wheel were tracks left (right, left, front, back)? • By what model of tire were the tracks left? • Did the cover of a tire-cover, which track was discovered at the scene and provided for the examination, undergo renewal repair? • Are there any signs of a vehicle on this object (victim`s clothes, road guard, road surface, etc.)? • Were traces on the object formed as a result of moving through it by wheels of a vehicle? • What is the order of forming damage on a vehicle? • What is the mechanism of track forming of a vehicle? • Is a found item (its fragment) (fragments of a bracket, screws, fragments of a headlamps lens or windshield, fragments of paintwork) a part of the provided for the research vehicle? • What is the mechanism of damage formation on the windshield of a vehicle? • On what type of vehicle was the lens, which fragments were provided for the examination, installed? • What is the reason of the destruction (mechanical impact, thermal impact, explosion, etc.) of glass, lens? • What is the mutual position of a vehicle and a pedestrian at the time of runover? • Was there the fact of contact interaction of the vehicle with other objects (area of the scene)? Listed issues can be solved during conduction of the complex research with other specialists.